on August 3, 2013 at 6:04 pm | Reply Sarah E.
Really great points, Ali. I’ve been so disturbed by the deer cull and have appreciated your insightful blogs and updates on the subject. You have such unique perspectives as a current student who is also so entrenched in the outside activism world (COK, your incredible blogging, your far-reaching writings at the MISC and on and on). Thank you for your feedback–let’s hope something good comes out of all of this. Based on the description written by Sarah E. Brown about the “Eat” issue of the “Vassar Quarterly”, I can say you’ve followed a popular, green and humane-washed temporary trend of food fetishists (“gluttens” if you read former Altantic writer Meyers piece critical of Michael Pollan’s “Omnivore’s Dilemma”). It would have been my hope that the intellectual and moral (not ethical) fabric of Vassar would have produced a more introspective, fact-based garment to wear than what you produced for “Eat”. That introspection would by necessity require including the broad spectrum of harms caused by the dietary choices featured in “Eat”. To bring it literally “down to Earth”, the harms extend to the poorest half of humanity impacted by dietary-induced climate change (26 to 51% of greenhouse gasses come from animal agriculture); the loss of biodiversity because of the harms of animal agriculture cast upon ecosystems (26% of Earth’s arable land is grazed by large and small agriculture operations while 70% of agricultural resources are dumped into the most inefficient way to produce food); the suffering of the poor when grain prices rise because of global market competitions that include demands for grain fed to farmed animals; and the suffering we impose upon wild and farmed individuals from other sentient species as we destroy their ecosystems and otherwise slaughter them without necessity are all essential to the discussion you omitted. As you may begin to infer, this is about justice and injustice, the latter being what “Eat” thoughtlessly causes. I would recommend you look for a screening of the new movie, “Blackfish”, a CNN documentary about the captive orca whale industry. It will easily open your love of the golden rule so you can more readily accept the knowledge in other like, “Peaceable Kingdom” and “Forks Over Knives”, as a beginning. I don’t mean to sound haughty, but the standards I would expect from Vassar have been violated. At least, I hope that’s the case because if “Eat” is business as usual at Vassar, that business needs to be further exposed in the media. I certainly will include it in the next revision of my book. Earth and all species—including us—are out of time because of what Earth, ecosystems, and the individuals from other species require of us. Food choices, human population growth, and consumer decisions have already done irreversible harm. Will you continue endorsing it? on August 3, 2013 at 5:58 pm | Reply Sarah E.
Send it her way, Will! A powerful letter. Why should the Vassar Quarterly cater to vegans/vegetarians when only 4% of the population cares to live that lifestyle? If most people eat meat and are happy eating meat, why should they spend a lot of time on alternatives? Maybe they should have put one recipe? But you can’t pretend everyone is a vegetarian and complain like a child about it. One, because ecosystems and biodiversity require a change in human ecology; and two (among many other reasons), because higher education is assumed to be an incubator that increases knowledge through a thoughtful dialogue which can happen only if more than one idea is presented for consideration. “If most people eat meat and are happy eating meat, why should they spend a lot of time on alternatives?” Because the last thing you want would be to learn by rote regurgitation of what is instead of what could, can, or needs to be. There was nothing in “Eat”, judging by the description, to offer food for thought or expanding dialogue. I’m sure you can appreciate that we all need this. Disclaimer: I’m not attached to Vassar, so I’ll leave it at that. Thank you. 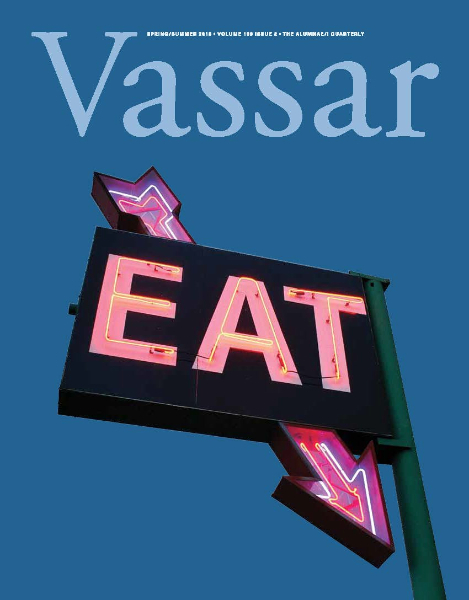 I don’t think that when Vassar published “Eat” they were meaning to be political or to have some sort of agenda. People really just need to calm down and stop crying that their viewpoint wasn’t raised. This isn’t a perfect world and everyone can’t always be in the spotlight. on August 4, 2013 at 12:57 am | Reply Rocky S.
Chuck, I find it incredibly dismissive of you to diminish a well-thought out critique (that you may not agree with) to the author “complain[ing] like a child” and “crying that their viewpoint wasn’t raised.” If you disagree and have a legitimate reason to disagree, please don’t detract from your point by insultingly infantilizing the author. Beyond that, Vassar prides itself on being a progressive institution that gives voice to niche perspectives and thereby empowers its “alternative,” largely social-justice oriented students. I do not know what your connection is to Vassar—or if you even have a connection—but food is a hot-topic on campus and one addressed from a variety of angles. It is also a topic that unites many current students and alums. This publication left out a prominent perspective from among these groups, instead featuring several individuals who reinforce the dominant cultural “ideology.” This “ideology,” as mentioned by Will, is wrought with socially and environmentally destructive consequences. Why the important vegan perspective have been given a voice by a publication targeting conscientious alums? I think it’s a problem that there wasn’t even a mention of vegan alums, but I can understand why, and I don’t think that Vassar intended to exclude their voices. I think the people that run the Quarterly probably just didn’t think to include a vegan voice. There aren’t many vegans in the Vassar community, and so the likelihood that there are vegans active in the Alumnae/i Association (which runs the Quarterly), are necessarily lower. Since you were involved with the publication, maybe you can speak to how they solicit articles and make editorial decisions. If the editors generally look for people to interview/profile as opposed to having people suggest interview/profile subjects, then maybe they should have solicited a vegan or vegetarian for interview. Moreover, plenty of the interviews in this edition are neutral as to veganism. The articles on Sierra-Rolet, Zalben, Rothbaum, Casas, Civitello, and the Zagats (arguably the biggest name in this edition) all take no stance as to the consumption of meat. I think a majority of the articles in this edition, in fact, take a non-political stance towards the consumption of meat. As for the recipes that were published in the journal and online: I’m not vegan, but it seems very easy to make many of these recipes using vegan ingredients. The paella recipe online requires you substitute vegetable broth for chicken broth and remove the eggs. Use tofu instead of shrimp in the gambas al ajillo. The poached peaches recipe is already vegan friendly. Sarah, you’ve already suggested a substitute recipe for the fudge. The only recipe that isn’t at all vegan friendly are the meatballs. To say that the publication should waste paper and republish an entire fudge recipe when most vegans are intelligent enough (in fact, I assume many vegans are more intelligent than the general population since they understand how screwed up the world’s system of agriculture is) to substitute coconut milk for cream, is really absurd. So, of the five recipes included, one is already vegan friendly, and three require very simple substitutions or exclusions from the recipe. That seems pretty good to me. While some of the remarks in the publication were grounded in bad norms (like the really gendered comments), I don’t think it’s per se offensive to not include the voice of one small demographic in an alumnae/i magazine. Maybe it would have been offensive had vegan alumnae/i been put forward as options to be included in the publication. As it stands, it doesn’t seem like that was the case. (If I’m wrong, you can ignore the rest of my comment, and please correct me). The reason I’m really disappointed in this critique is because I think the vegan and vegetarian groups at Vassar are the most effective advocates and activists at Vassar, and it doesn’t seem like that community was actively involved in engaging with the quarterly to actually get those voices included. on August 4, 2013 at 12:20 pm | Reply Sarah E.
I appreciate many of the points you address. I guess what it comes down to is prioritization. The bottom line is animals’ suffering and abuse is being glorified in the issue. Bringing attention to this is my priority. I understand the substitution issue, and I guess that it is wrong that vegans are so often asked to “substitute” in recipes. And I don’t disagree that a vegan recipe should have been included in the quarterly. Also, I totally agree that one small demographic can change the world, but I still think it’s too strong to call the content in the Quarterly offensive. I take issue with some of your rhetoric, not the thrust of your argument. Perhaps the publication was problematic in not considering vegan voices, and I think you’re rightly offended that they didn’t. But I think to attribute malicious intent and hold animosity towards the editors for including non-vegan recipes and interviewing people who cook and consume meat is also problematic. I think the basic contention of my argument is that I think that opening a dialogue with the editors of the Quarterly and the Vassar administration is more productive than calling them racist, sexist, and untuned to gender politics, especially when many of their biases are probably unconscious. on August 4, 2013 at 2:10 pm | Reply Rocky S.
I didn’t feel Sarah was suggesting that the problematic elements of the Quarterly only be called out online without any sort of accompanying dialogue. I saw quite the opposite, with her suggestion at the end of the piece that those passionate about the issue contact the editor. Alums have limited means of establishing a dialogue with Vassar, and in this case a letter to the editor and blog post (that has clearly prompted dialogue) seems appropriate. Current students are momentarily limited by summer break, but perhaps in-person conversation about how the publication can be made more inclusive and less problematic can be initiated in the fall. Assuming the editor was unaware of the problematic components of the publication does not mean we should refrain from public critique, though it should factor into how a dialogue is approached. On a personal level, I of course understand that any publication concerning food that is not explicitly veg*n will include meat-centric pieces. Yet, as someone who identifies as a conscientious, environmentalist, food activist (and who has connected with Vassar alums through this shared identity), I found the meat-centric nature of three pieces—”The Gritty Life of a Food Activist,” “Conscience in the Kitchen,” and “Greener Pastures”—to be a slap in the face to my and others’ efforts. I think this should be made known to the Quarterly. on August 4, 2013 at 3:48 pm | Reply Sarah E.
I have just received an e-mail from Elizabeth Randolph, Editor of the publication. Thank you for bringing your blog post to my attention. You’re right when you say that we missed the opportunity (and perhaps failed in our obligation) to present the vegan and vegetarian perspective in this issue and that we should have done so. I have also heard from students from a campus group concerned about the ethical treatment of animals. You and they have let us know about several Vassar alums and students who are actively working on advocacy and education around veganism and vegetarianism. I’m looking forward to learning more about them and to following up in an upcoming issue. I regret our omission and appreciate the initiative you’ve taken to broaden the discussion and coverage around food issues. on August 4, 2013 at 4:04 pm | Reply Sarah E.
Thank you for your e-mail response, and thoughtful words. I appreciate your willingness to address this. I really look forward to seeing this followed up on in an upcoming issue, and thank for your work serving our wonderful college!